Federal OIG Subpoenas Attorneys - Oberheiden, P.C. OIG subpoenas are subpoenas issued by the Department of Health and Human Services and the Office of the Inspector General to investigate health care fraud allegations without the involvement of a court. The underlying fraud allegations are typically a violation of the False Claims Act, Medicare Fraud, Medicaid Fraud, Tricare Fraud, or a violation of the Stark Law. In order to keep the investigation civil and not criminal, it is critical to have experienced defense counsel, such as our former federal health care prosecutors, to be by your side and resolve the allegations by way of confidential and discreet negotiations with the government. What Prompts an OIG Subpoena? To many people, receiving a subpoena from the Department of Health and Human Services or the Office of the Inspector General comes as a big shock. OIG subpoenas are typically triggered by one of two events. The most common reason your business will receive an OIG subpoena is because an insider such as a former or current employee or business partner has represented to the government facts and information that the government considers credible enough to look into your business operations. This reporting by an insider such as a former employee is often done by way of filing a qui tam, also known as a whistleblower lawsuit, against your business. The second reason the government becomes interested in your business operations is by investigations conducted by federal agents. First and foremost, you need to hire experienced defense counsel to assess the subpoena request and the merits of the government’s case. Among the very first steps we take in OIG subpoena cases is to find out for our clients whether or not the case is civil or criminal in nature. OIG subpoenas do not explain if the government is seeking civil penalties or criminal indictments. If we are engaged, we will activate our EMERGENCY DEFENSE PACKAGE to make sure that your business and your name continue to enjoy its reputation. The EMERGENCY DEFENSE PACKAGE is an action plan that we apply whenever a client is the target of a government investigation to avoid criminal charges. Years of experience have shown that too many mistakes are being made in the early stage of a case because business owners attempt to defend their business against the government by themselves. In all of these cases, business owners hurt their business more than they protect it. In many cases, disgruntled former employees reported alleged misconduct that led the government to investigate the allegations. What documents are requested in OIG subpoenas? OIG subpoenas typically request documents about business structure, billing records, financials, marketing materials, existing legal opinions, and email communications between senior company officials. OIG subpoenas can be enforced by federal prosecutors at the Department of Justice. Not responding to an OIG subpoena may result in contempt of court and criminal investigations. How do I know if the subpoena is civil or criminal? 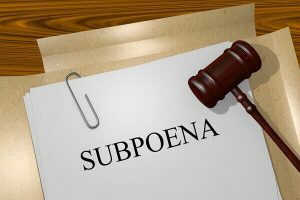 By its nature, OIG subpoenas are administrative, and it is not evident from the subpoena itself whether the underlying investigation is civil or criminal. What is the goal of an OIG subpoena? The OIG wants to receive and review records that they consider helpful evidence to prove the underlying allegations. Do I have to produce everything in the subpoena? It is not uncommon that OIG subpoenas request a large number of documents and emails over a period of many years. Experienced lawyers know and understand how to work out a compromise with the government. What is the jurisdiction of OIG health care subpoenas? Because the OIG is a branch of the federal government, all OIG investigations necessarily deal with alleged federal program fraud. What are the most common fraud allegations in OIG subpoenas? OIG subpoenas are based on Medicare, Medicaid, or Tricare fraud, violations of Stark Law Provisions, violations of the Department of Labor policies and rules, or more broadly, violations of the False Claims Act. This makes it illegal to submit wrong, false, incorrect, or erroneous requests for reimbursement to federal payers such as Medicare and Medicaid. The False Claims Act is a hybrid statute that allows the government to collect civil penalties or to initiate a federal criminal investigation. Which federal agency investigates health care fraud? Depending on the underlying allegations, agents of the U.S. Postal Service, the FBI, or the DEA may be helping the OIG with its investigation. No Civil or Criminal Liability for Our Client. At Oberheiden, P.C., we greatly value our stellar reputation for defending clients against federal investigations. Of course, reputations are built, not bought. Below are some of the reasons why our clients trust us so much. Our attorneys enjoy decades of experience litigating in federal court, negotiating with federal authorities, and untangling vast and confusing arrays of federal regulations. We can advise you on compliance with federal regulations to minimize your risk of being investigated in the first place, and we can help you respond effectively once an investigation has commenced. What perspective means to us is the ability to understand a case from both points of view – not only the defendant’s point of view, but the prosecution’s point of view as well. That goal comes easier to us than it does to most law firms, because several of our lawyers are former federal prosecutors who enjoyed distinguished careers with the Department of Justice (DOJ) before joining us. Quite a number of our clients have been shocked when their investigation or prosecution was closed with no civil or criminal liability. Others have enjoy outcomes that far exceeded their expectations. Over the years, we have successfully resolved cases with both the DOJ and many other federal agencies. Federal investigations and prosecutions are adversarial to the core. It is best, however, to think of it not as a boxing match but as a war between rival armies. The government will certainly draw from its vast resources to assign your case to a team of investigators, federal agents, and prosecutors. You need a team of your own if you are going to fight back effectively. We can provide you with a legal team that has learned over the years to work together cohesively. In a worst-case scenario, a federal prosecution could take years of your life away from you. Even more moderate outcomes could include corporate bankruptcy and other long-term consequences. At Oberheiden, P.C., we consider full commitment to our clients to be our sacred responsibility – we will take your case as seriously as if we were the targets of the investigation. Contact our offices today to discuss your OIG subpoena with an experienced fraud defense attorney. We are here to help you. Oberheiden & McMurrey is a team of former federal prosecutors, former Department of Justice trial attorneys, and respected defense lawyers. Many of our attorneys previously supervised OIG investigations in leading positions at the U.S. Attorney’s Office. Throughout our careers, we have handled over 1,000 OIG investigations across the United States. If you received notice from OIG, you should speak with Dr. Nick Oberheiden, former Assistant United States Attorney Lynette Byrd, or former DOJ-prosecutor Bill McMurrey. Request a free and confidential assessment today.